At risk of sounding like a 7th grader, OH MY GOD YOU GUYS THIS IS SO COOOOL!!!!!! And clever. And easy peasy. Jennie Slade, mother of 4 and keen photographer (where does she find the time...) is the brains behind this bit of Brady Bunch beauty. Oh, and please, check out her blog by all means. i am so doing this one day. might need to wait until i have more of a "bunch" though! Oh my goodness, this is SO the coolest idea ever! 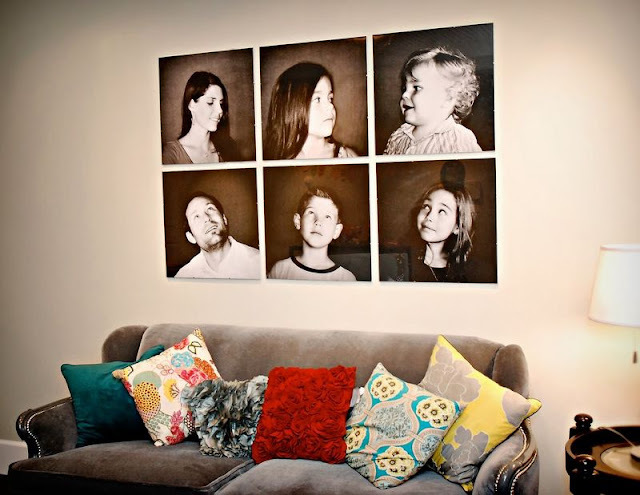 Not only are the photos cool, but I am loving her sofa and pillows too! Thanks for sharing.